All the following details have been researched from freely available sources. Christopher Thomas Langman was born in Danbury Essex on 24th December 1886. He was the first born child of Thomas and Christiana Langman and first grandchild of George Musgrove. 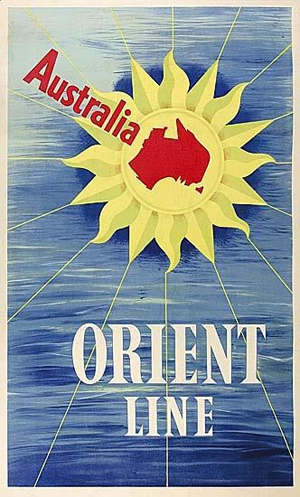 This research traces Christopher from his apprenticeship as a carpenter, his connections with the Wornham family in Redhill, and subsequent emigration to Australia and marriage to Janet Wornham in 1911. This story begins 10 years earlier in Redhill Surrey. Christopher Thomas Langman was taken on as an apprentice by Robert Edward Bristow, a builder of Earlswood Road Redhill. In the years that followed he became acquainted with the Wornham family who were painters and decorators by trade. It is uncertain whether Christopher worked for them but they were to become firm friends. 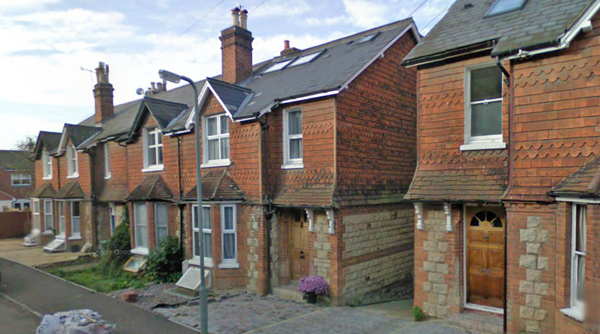 The Wornham family by 1901 had moved 97 Grove Hill Road Redhill (pictured above present day). The family are shown on the 1901 census below and comprise of Peter Wornham 54 and his wife Janet 54, and 3 of thier children, William 26, Janet 14 and John Roger Wornham 12. Peter and Janet Wornham's son Frank in 1901 was aged 21 his occupation was a house painter. The census below shows Frank and his wife Alice Maud who he married in 1900. She was the daughter of James and Elizabeth Selley. James is listed as a widower who is living with them. Sadly Frank's wife Alice died in 1902. Frank then married Alice's sister Beatrice Louise Selley in 1903. They had one child named Frank James Wornham who was born later that year. The marriage was not successful and the couple parted company. His son Frank James was brought up by a family in Wembley. His former wife Beatrice married Achille William Olivieri in 1914. They had one child, a daughter named Ivy Daphne Olivieri who was born in 1916 but died aged 16 in 1932. The marriage certificate below shows no indication of Beatrice's marriage to Frank Wornham. She lived until 1970 when she died in London aged 90. Her husband Achille Olivieri died in 1943 in London aged 63. 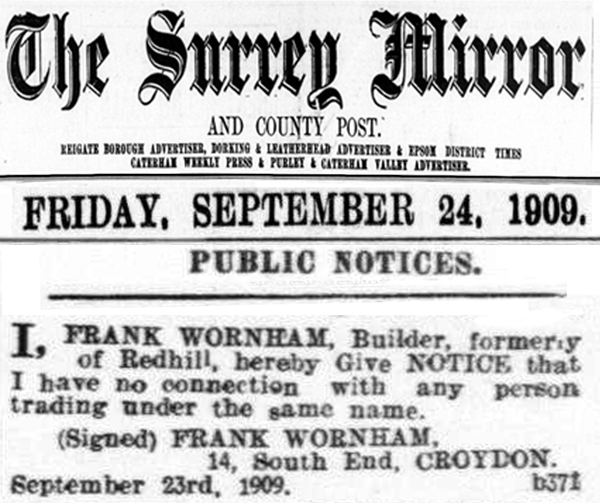 Frank Wornham then remarries in 1908 in Croydon. His 3rd wife was Alice Helena (Eleanor) Hood, the daughter of William and Emma Jane Hood who were soon to also feature in this story. Frank and Alice's only child, a daughter named Eleanor Ishbell Frances Wornham was born in Croydon in 1909. She was known in later years as Ishbel. 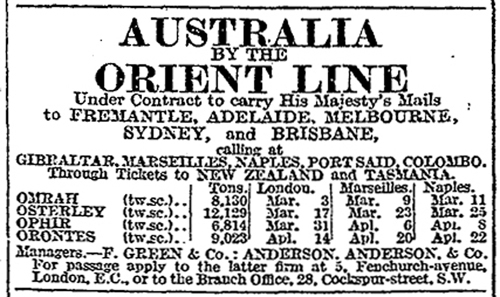 as Frank Wornham, so this advertisement is a mystery. Croydon with the Dukes Head on the left. 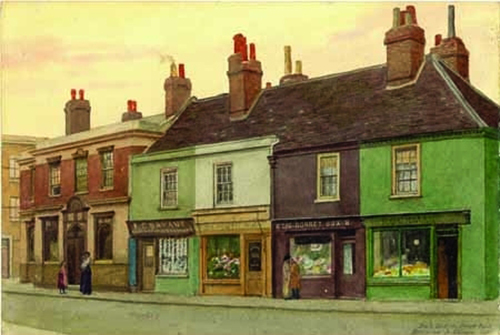 The pub is sill there present day. the pub purely as an accommadation address. their two children Alice aged 20 and William Cyril Hood aged 14. Alice married Frank Wornham in 1908. The fortunes of the Wornham family were to change. 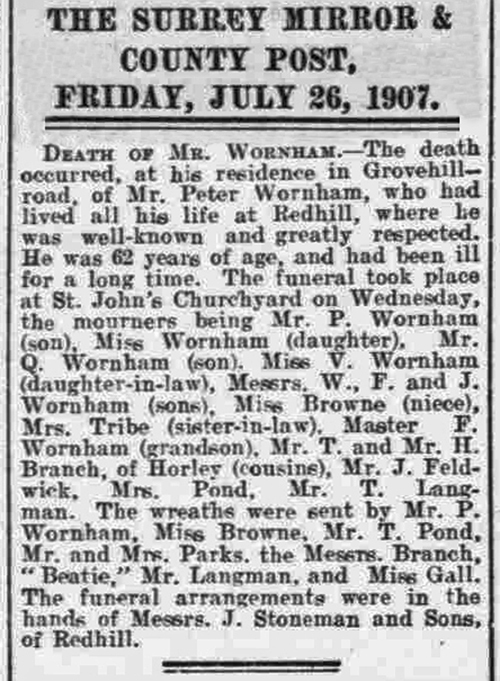 In 1907 Peter Wornham died aged 60. His wife Janet died the following year in October 1908. Of their 11 children born only 6 survived at this time. Peter Alexander Wornham (born 1868) continued the building business, his brother Quinton James Wornham (born 1869) was an hotel proprietor. John Roger Wornham remained living in Redhill and later emigrated to Canada where he died in 1946. The other three Wornham siblings namely William Walter Wornham (born 1874) his brother Frank (born 1879) and younger sister Janet (born 1886) must have around this time decided to emigrate. 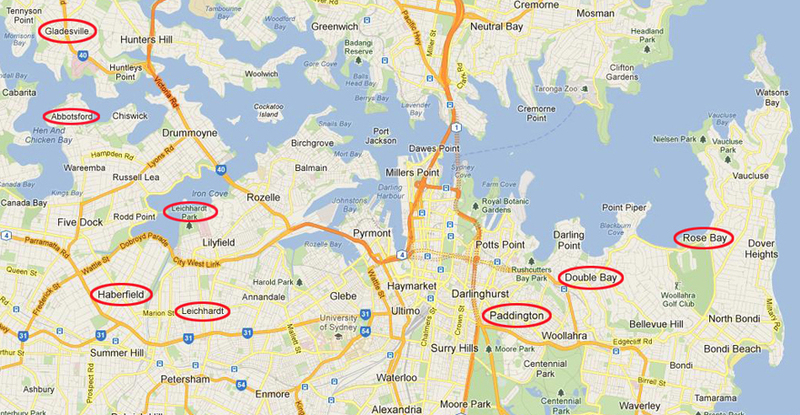 Sydney New South Wales was chosen as their destination. Together with the 3 Wornhams named, Frank's wife Alice with her daughter Eleanor and her parents William and Emma Jane Hood would move to Australia. We imagine that Janet Wornham became engaged to marry Christopher Thomas Langman around this time,so he became part of the exodus from Redhill. It was decided that the depature date would be set for January 1911 with the various parts of the family splitting into 3 groups. 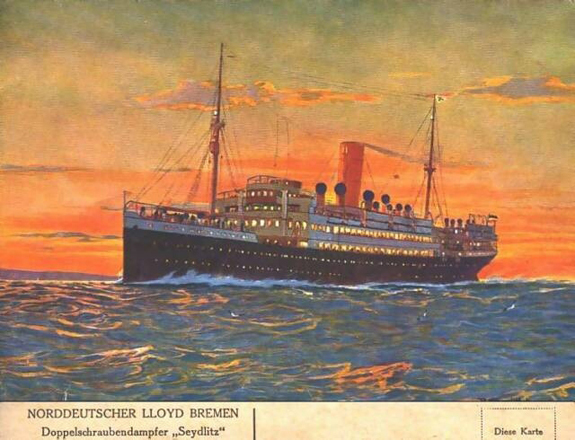 The first and second groups would depart from Southampton on Nord Lloyd ships from Bremen Germany bound for Australia. 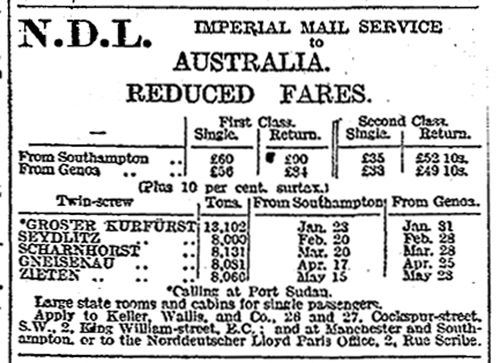 The final group would leave London on a British ship. Why they chose to travel this way and not together on one vessel is not known. 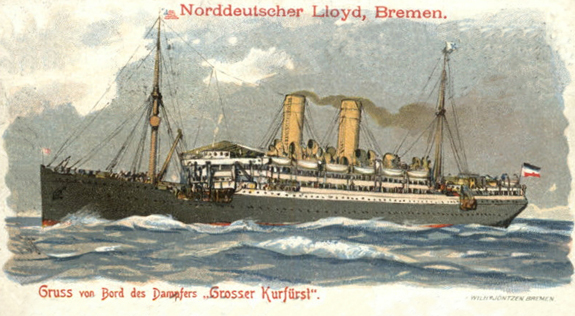 Frank Wornham and his bother in-law William Cyril Hood were the first to leave England, departing Southampton on the Nord Lloyd Bremen ship Grosser Kurfurst. 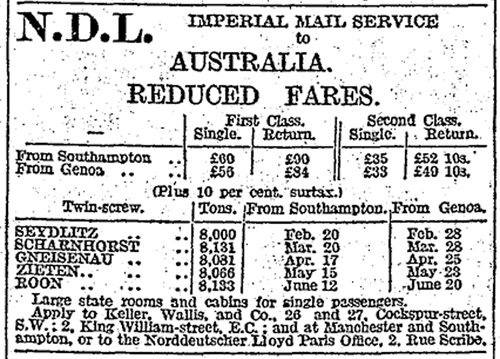 The ship sailed 23rd January 1911. They arrived 10th March. Click on the image below for the Passenger List. 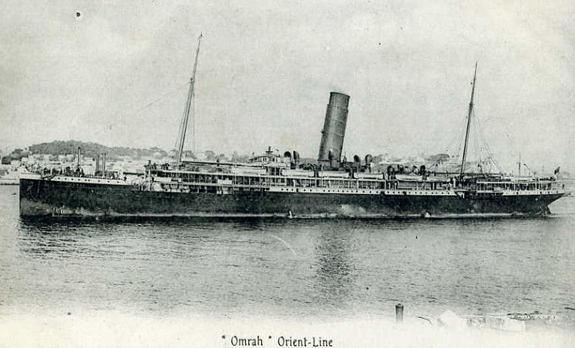 Frank Wornham's wife Alice, their daughter Eleanor and Alice's parents William & Emma Jane Hood made up the 3rd party departing London on the Orient Line ship Omrah on 3rd March 1911. They arrived 12th April. Click on the image below for the departure Passenger List. Click on the image below for the arrival Passenger List. not stay together as an enlarged family. Click on the links below for the continuing story of each individual family. Please contact us if you are a descendant of any of these branches of the family. We would love to hear from you especially if you can add further details to these stories. Locations circled in red where the Langman and Wornham extended families lived over the next 50 years.